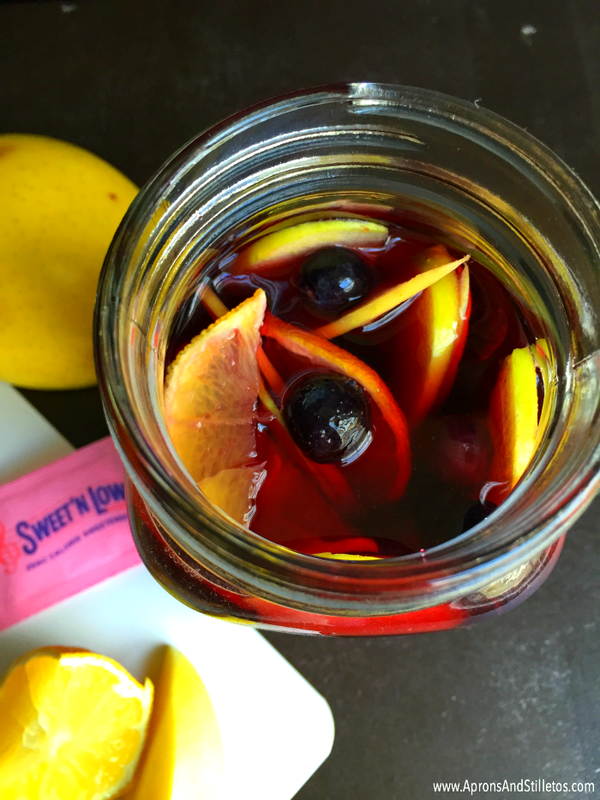 I have a deliciously sweet Fruity Fall Sangria recipe for you today and it’s sponsored by Socialstars in partnership with the #donthesitaste Sweet’N Low® campaign. All opinions are mine. Beautifully photographed food and beverages inspire me. They inspire me to make new recipes for my family and give me so many ideas that our meal plan never gets boring. The same is true of beverages ideas. I can’t count how many new beverages we’ve had this year alone, all because of my love of mouthwatering pictures. 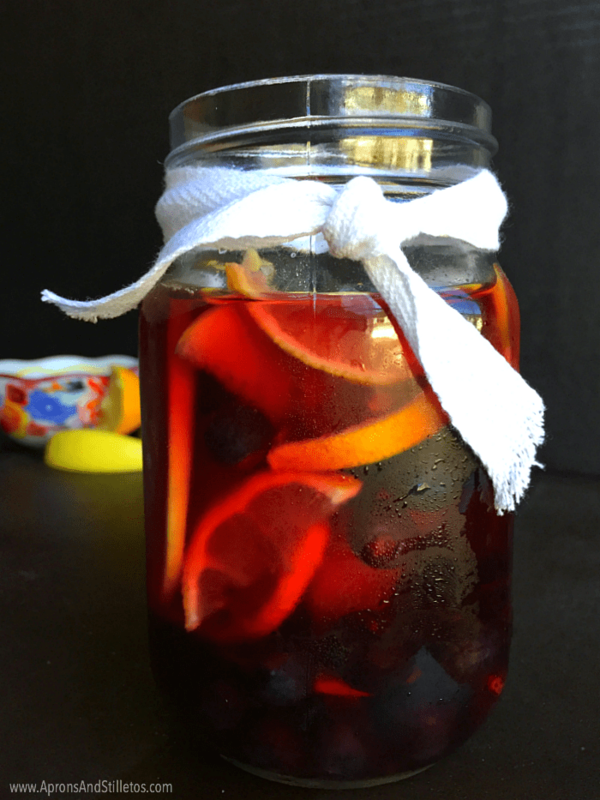 My latest beverage inspiration is a Sangria. I had no idea what a Sangria was before making it. All I knew is I was intrigued with how beautiful they looked in magazines and on foodie blogs. According to Wikipedia, a Sangria is a beverage originated in “Spain and Portugal which normally consists of red wine, chopped fruit, sweetener, and a small amount of added brandy”. 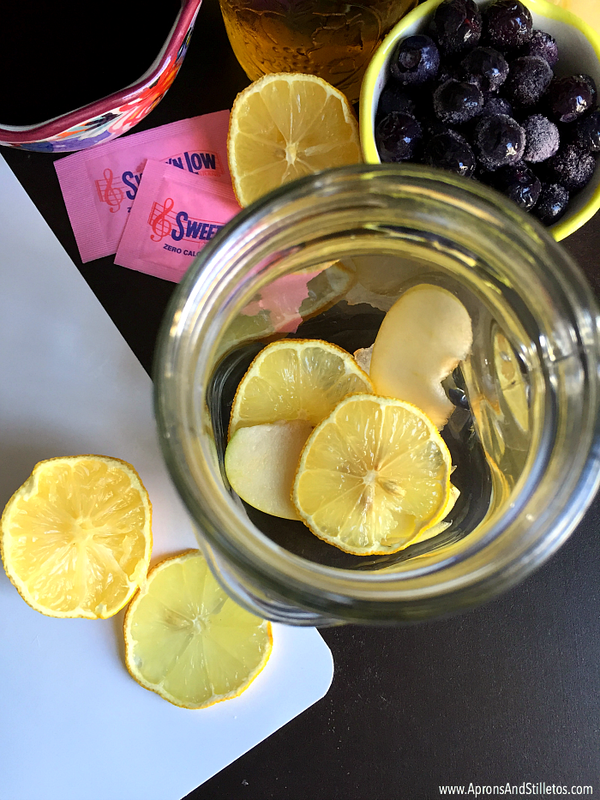 I don’t drink liquor so I’m going to omit the Brandy in my recipe and instead of sugar, I’ll use Sweet’N Low® zero calorie sweetener. Two packets should be enough to provide a hint of sweetness without the extra calories from sugar. Thinly slice the apple and lemon and add them to a 12 oz glass. 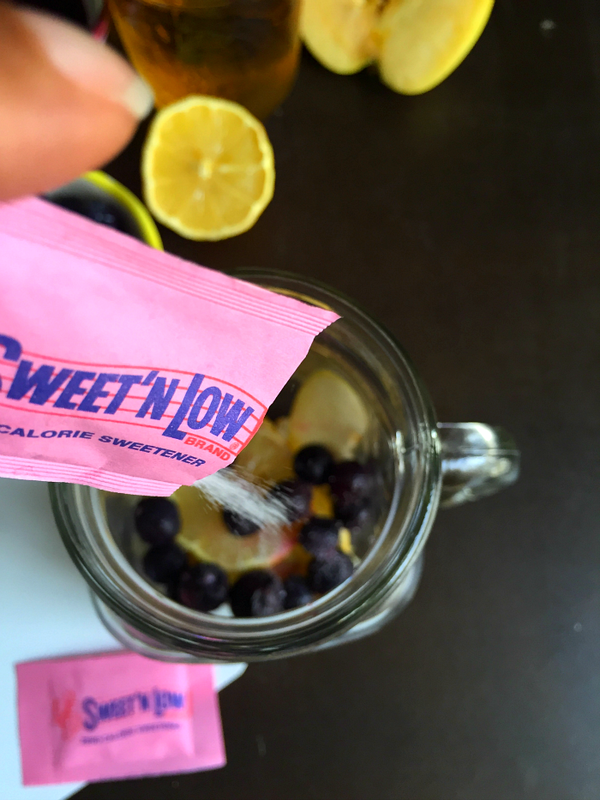 Pour in the blueberries and (2) Sweet’N Low® packets. 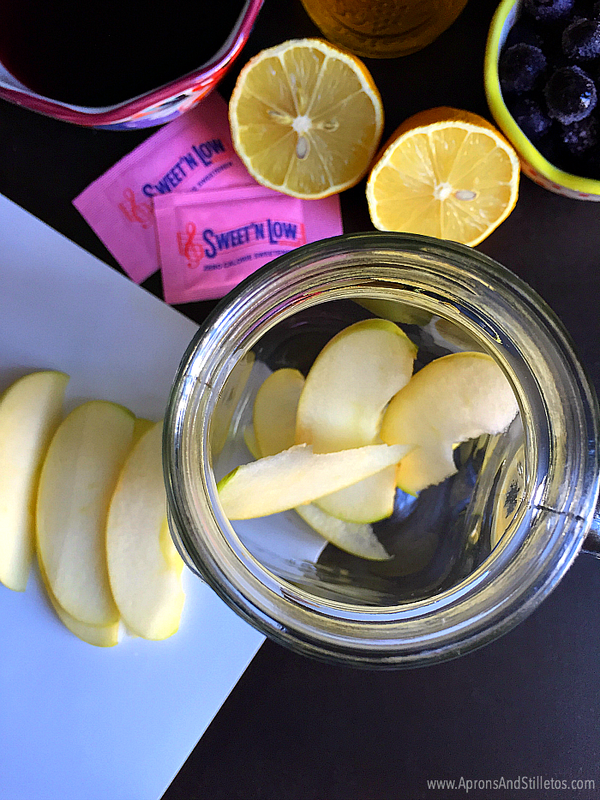 Pour the wine and apple juice over the fruit and stir to dissolve the Sweet’N Low®. 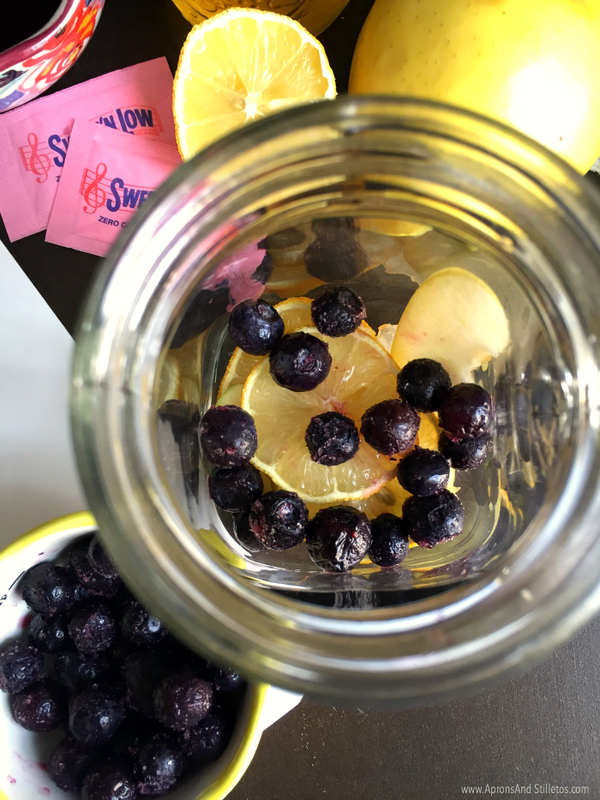 I loved how light and refreshing my version of a Sangria turned out. It’s was just what I needed last Friday after a long week. 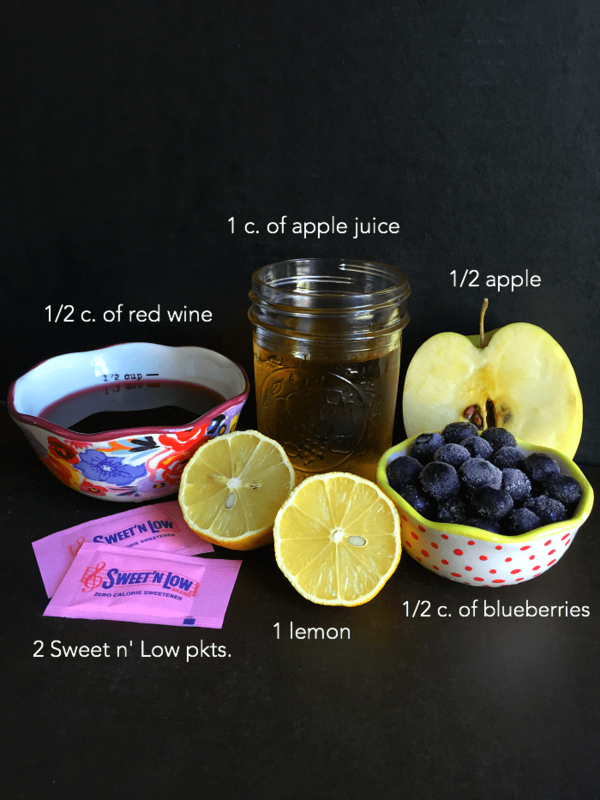 This is an easy low calorie recipe that can be whipped up in advance or when I want some sweet and fruity to drink. Craving more yummy and easy recipes, check out my latest creations here. This looks perfect! I have to try this!! This looks really delicious. It's the perfect drink to entertain. That is a beautiful! It looks so seriously amazing. This looks like its worth a try at making. Love the selection of fruit! A refreshing glass of sangria, is just thing you need after a long day;Thanks. I am going to try it with stevia. We both had sangria on the mind, didn't we? I love them. They taste so great with the fruit infused inside. This looks and sounds fabulous. I absolutely love sangria but tend to only have it in the summer. Thanks for reminding me that fall is also the perfect time. You had me at Sangria! Beautiful pictures of drinks like this speak to me too! This looks amazing! I have never attempted trying to make something like this. I think I might make this for Thanksgiving. This looks amazing. I've never made Sangria at home but will try this. I've always wanted to try to make a Sangria. I love that you have used fresh fruit in yours. I always serve nice wines to company, but often folks want something sweeter. This is perfect! Thank you. This would be a fun Thanksgiving addition! I will have to try this! Sounds Tasty! I would skip the sweet n low. It would be interesting to incorporate pomegranate. That drink looks so delicious. I love that this is so easy to do. This is perfect when entertaining friends. Such a simple recipe and must be yummy. Great pictures. Looks delicious and simple! Love an easy recipe like this! A fall sangria? Yes please! I love anything fruity! Been researching to write a blog on holiday drinks and agree images are so important. As a visual learner, I love seeing the process & progress. That sounds good! Pretty pictures too!